Ursula Hill is a senior consultant for School Turnaround at AIR. 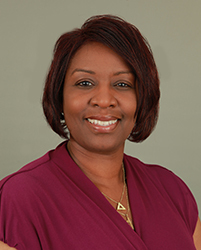 Dr. Hill has more than 22 years of experience in public education as a special educator and school administrator with substantial knowledge and experience working with Title I schools and transformation initiatives. As a senior turnaround consultant, she has served as an onsite coordinator and special education coach assisting school improvement efforts in Virginia. Dr. Hill has worked on the project team supporting Buffalo Public Schools in the state of New York as a leadership coach assigned to schools receiving federal school improvement funds. She also has trained state, district, and local school officials in the state of Oklahoma on student learning goals and objectives. In addition, she participated in the New York City Department of Education School Renewal Assessment project as a member of the document review and report development teams. Dr. Hill has performed Intentional Data Reviews for academic and perception data and for the Illinois Center for School Improvement for various schools throughout that state. Currently, she serves as the South Carolina state liaison for the Southeast Comprehensive Center (SECC) and provides technical assistance support for other states within the SECC network. In her role at SECC, she works to build the capacity of state education agencies with their efforts toward supporting districts and schools.